I was an Equipage fiend. When I smelled Equipage for the first time in Los Angeles in 1993, I became hooked on the perfume in seconds and, for weeks, took the bottle with me everywhere I went…spraying, spraying, spraying all through the day. My best friend, a perfume fanatic herself, asked me on one memorable occasion to “STOP!” applying, or should I say RE-applying, Equipage. My friend and I were going to dinner and she made a quick stop at a dry cleaner’s to pick up a dress; when she returned to the car, the Equipage fumes were so strong she began to cough. She smelled Equipage in her car for days afterwards (but went on to buy Equipage aftershave for her father at Christmas). I depleted my last bottle of Equipage around 1996 and I decided to take a “break” from the fragrance so I wouldn’t tire of it. I never got around to buying Equipage again. Now, I am about to smell it for the first time in 13 years. Here goes — (pssssst!) — AAAAAAHHHHHHHHH! I’m in heaven! Balmy, relaxed, warm and addictive, Equipage is as I remember it — and I want to use every drop of my Equipage sample immediately. Equipage was created for Hermès by perfumer Guy Robert and it debuted in 1970; listed notes include bergamot, lily of the valley, carnation, jasmine, pine, rosewood, tonka bean, vetiver and patchouli. Equipage opens with a “blur” of summery bergamot and ‘spice’; I detect clove-carnation almost immediately, and other well-blended floral notes mingle with light pine. Equipage’s notes gather together and create a “faux” tobacco accord — imagine shredded, blond tobacco leaves dampened with mellow resins and smooth patchouli. When I first wore Equipage ages ago, I couldn’t figure out WHY I liked it so much; now I know. I love incense and the Japanese “listening to incense” ceremony; during the ceremony, an aromatic woodchip is placed on hot ash or onto a hot mica plate and is slowly warmed to release its scent. Equipage’s combination of “toasting” sweet wood (almost smoky), spicy flowers and strange tobacco-resin reminds me of the fragrant woodchips used in the incense ceremony. My friend who ordered me to “STOP!” reapplying Equipage almost 16 years ago is still my friend; I can’t wait to saturate myself with Equipage and pay her a visit. Will she remember Equipage? I hope the carefree, blissful aroma of Equipage takes her back in time to a sunny (and funny) Los Angeles afternoon. 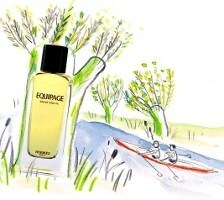 Hermès Equipage is available in 50 and 100 ml Eau de Toilette. K: Much as I love Hermès, I haven't gotten around to trying Equipage or Bel Ami. I guess I need to correct those omissions! For some reason, I always thought Equipage was a leather scent, and leather scares me (though I'm getting over that due to the gateway drug that is Dzing!). You've once again made something sound too delicious not to try. My credit card thanks you. How lovely! I will get a sample of this myself, as “balmy, relaxed and warm” is exactly what we need here on the frigid eastern seaboard. Thanks for sharing it with us. Exist: I'm convinced by blood pressure goes down the moment I sniff Equipage…so nice. Then I definitely need some. Thank you for another great review, Kevin! I love a good incense scent. Would you say this was a unisex fragrance or a manly one? I could not find a single review on Basenotes that was marked as being written by a woman. The floral notes lead me to believe it is more unisex than not. Oh, man, yet another on my long long list of to-try. Will I even live long enough?? Divinemama…I think it's unisex..but more towards the “masculine” side of things. I'll be seeing my friend tomorrow…soaked in Equipage I'll be! HA! Tama: NONE of us will live long enough for all the perfumes “out there”…and continually coming. My friend Joel always tells me that I will have to be embalmed in my fragrances when I die because that's the only way I'm going to be able to use all of them up! Being a fan of Ancient Egyptian history and mythology, this actually appeals to me, but instead I think I'd rather leave certain perfumes to certain friends…and then let them wonder why! Sorry just a little black humor for a Thursday afternoon. LeMaroc: if you're like most of us here…your friends will be receiving more than one bottle each! I began wearing Equipage when I was 14 and love it just as much 10 years later. Its unexplainably divine. MarkDavid: ah! so you bypassed the “Axe Age!” Good for you! krokodilgena: you might smell a WEE BIT 'manly' if you wear Equipage. HA! Believe me, thinking of Bel Ami when you hear “TIJUANA” is better than what most people think of when that city is mentioned. Santemon: they do have a “French” vibe. Coincidence: Today we've been discussing 'vintage' versus 'new' Equipage on Basenotes and the comments are divided. Some say (like you) it's just the same. Others swear the vintage is deeper and lasts longer. I remember smelling (or wearing ) some as an adolescent but honestly its been YEARS since I've given it a full wearing. Now I'm even more intrigued. Mike: I really don't smell a difference in strength or lasting power. LeMaroc: You brought back a funny memory of an art history prof (who was also an NYC performance artist) during my freshman year who said she — unlike her friends who all wished to be cremated — wanted to be embalmed in full Ancient Egyptian style. This is a really hilarious review. I must dig out my sample of equipage and spritz away! LOL – “birds of a feather”. My BA is in Art History (and Ancient Civlizations). I recently tried Be Ami for the first time and absoutely loved it! If you say Equipage is even better then I guess I have to give it a try too. And I love the comment on being embalmed in your own fragrances, I guess the same goes for me! AnnaSa: Bel Ami is different from Equipage…but hope you like it. If you'd wear Bel Ami…Equipage won't be too masculine. And I hate to rain on your parades…but I don't think perfumes will embalm you…you'll need something more powerful. HAHA! I haven't tried either Bel Ami or Equipage…but I love Eau d'Hermes! Dear friends, I have now just been to the HErmes boutique to try Vanille Galante, and although majestly done, I do not feel it, it is too flowerly for me, so I HAVE 4 Samples and If anybody Wants (robin & C) please write me an e-mail on savu50@katamail.com and I would be glad to send it to you. Hi Kevin: based upon your side-splitting review of Monsieur Balmain, I ordered it unsniffed. Much to my delight, it’s wonderful and I love it. Now I am ordering a bottle of Equipage, on the assumption that, if you love it so, it just has to be fantastic. I’ve been very curious about sniffing it for awhile. Also thanks to your review, I have on order the only remaining bottle of Givenchy Vetyver that Nordstrom’s had in the whole US. It sounds like it has been discontinued (again). I love your reviews, and M. Balmain is now thumbtacked to my wall, where he provides me with a LOL break every day! Hi Kevin: finally, my bottle of Equipage arrived, and it truly is wonderful! I also ordered Fath Green Water based on your review and it’s lovely, so crisp and clean. If it ever warms up in New England, it will be the perfect scent for the hot and humid weather… so I am a big thumbs up on all 4 of 4 scents purchased UNSNIFFED based on your reviews (M. Balmain, Equipage, Green Water, Givenchy Vetyver)!! Thank you so much, Kevin! Dzing: WHEW! Glad to hear it!